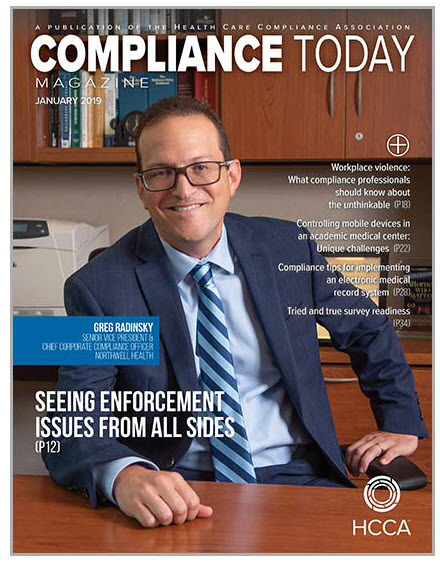 Each month you will receive the Compliance Today (CT) magazine, available both in print and digital form. In each issue you’ll find invaluable information for healthcare compliance professionals. Plus, you’ll enjoy access to the magazine’s archives. You will automatically be subscribed to a weekly e-newsletter providing the latest news in healthcare compliance. Members receive discounts on HCCA conferences, academies, and web conferences throughout the year. Members receive discounts on HCCA publications and training videos. Join the conversation on HCCA's Social Network, HCCAnet. Get your healthcare compliance questions answered and share your insight with over 10,000 compliance professionals. By becoming a member of HCCA, you are joining a culture that says, “Let’s do it right!” Help your staff expand their professional resource network.